This unit, Ver. (3.08 Ver. 4.02, with a NA M Land 1.03 base map) about $300.00US, check prices (HERE) is basically a Meridian Gold with the addition of an electronic compass and barometer, and is a competitor to the Garmin GPSmap 76S. NOTE: The new MapSend DirectRoute maps will provide more accurate maps plus provide automatic routing. The function of this electronic fluxgate compass is an advance over the design of the Garmin compass. 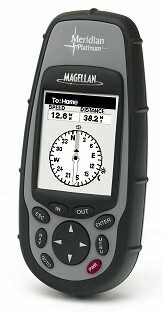 Where the Garmin compass must be held horizontal to read, the Magellan three-axis compass can be read from horizontal to a tilt to vertical at which point the back of the unit is the heading being read. The vertical position is also the most optimum position for signal reception, thus the best arrangement for locating a Geocache -for example. All of the navigation screens use the compass information for heading data. Other than that they are the same as in any of the other Meridian products. The Destination Pointer graphically displays the bearing to the destination. The Destination Icon further reinforces which way you need to turn to arrive at your destination. This pointer makes it a little simpler to read your heading. Your heading is always in the direction of the top of the Meridian Platinum so this arrow will always be pointing straight up. This unique pointer, not available in the Garmin units, is a useful new feature. When using the Compass Screen to steer to a destination, the goal is to align the destination Pointer and the COG Pointer together. When both of these pointers are lined up, regardless of your heading, you are moving in a straight line to your destination. This is a welcome feature for sailing enthusiasts. Note: The Destination Pointer points to North, and the Destination Icon disappears when there isn't an active route or GOTO. The electronic compass requires that it is recalibrated every time the batteries are changed. 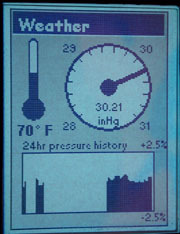 Failure to calibrate the compass could result in errors of 20° or more to the displayed heading. Calibration is very simple and doesn't take more than a couple of minutes. The calibration is similar to the Garmin calibration, but adds one more step to accommodate the 3-axis capability of this design. As usual, it's very important that there are no metallic objects near the Meridian during this calibration. 1. Lay the unit down face up on any LEVEL, non-metal surface. 2. Press the MENU button, highlight “Setup”, and press ENTER . 3. Highlight “Compass Calibrate” and press ENTER. 4. Using the on-screen “bubble level”, set the Meridian on a level, non-metallic surface. 5. The Meridian Platinum will provide the instructions on rotating the receiver. 7. After the beep, turn the Meridian Platinum FACE down. Very soon it will beep again. When this happens, calibrating the compass is finished. Electronic Compass’ have some limitations as to how well it works in certain environments. Large metal objects can affect how well it operates. As an example, using the Meridian Platinum in an automobile you'll find that the compass does a great job of pointing to the engine but not pointing to north. In this situation, use the Setup option “Compass Orient.” to change the compass orientation to "GPS Course". Then the Meridian Platinum will get its heading from the GPS signals and not the electronic compass. NOTE: The compass is active (unless turned off) at all speeds and not just below some set speed -as with the Gamin GPSmap 76S. Other limitations are in the angle holding the Meridian Platinum. Holding the receiver flat provides the most accurate readings but tilting it towards you is acceptable. Pay attention to the compass readings as you tilt it. At a certain, point the compass will begin to drift. The Meridian Platinum has compensated for tilt but still, the more it's tilted, the more will be the errors in the compass readings. The Meridian Platinum has a major advantage over many other electronic compasses on the market today in that it can be tilted and still maintain relatively accurate compass readings. Battery life is limited up to 9 hours with the compass operating continuously. The compass is operating any time heading is being displayed. So, while on either of the two compass screens or on the Map Screen (the position cursor is pointing to your heading), the compass is running. On the other navigation screens, the compass is off unless Heading is selected for one of the data fields. In order to turn the compass (completely) off, go to Setup, and with the “Compass Orient” option, change it to “GPS Course”. To restore, select "Magnetic North". In addition to the electronic compass, the Meridian Platinum provides a “mini-weather station” with temperature and barometer information. A new bar indicating the barometric pressure is added to the graph once every 15 minutes. If during the course of an hour it has taken two readings, it fills in the gap between the readings. 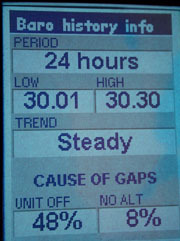 If, however, the receiver has been turned off, or it does do not have enough satellites to compute altitude (four satellites are needed for altitude computations), and only one reading or less has been taken in the course of the last hour, there will be gaps in the chart. This is not a requirement for using the temperature and barometer readings, it simply makes the readings a little more accurate. 1. From the Weather Screen press MENU, “Calibrate”, and press ENTER. 2. Enter the corrected temperature and barometric pressure values, and press ENTER. You can also view the barometer history displayed in the barometer graph in a textual format. This screen will also provide the low and high barometer readings for the last 24 hours as well as the reason for the gaps in the chart. From the Weather Screen press MENU, “Baro history info”, and press ENTER. Since the temperature sensor for the Meridian Platinum is inside the receiver, it is trying to read the temperature of the receiver and not the ambient temperature. There has been compensation made to the temperature readings in order to accurately represent the ambient temperature. Temperature readings in the Platinum seem to be quite accurate. The accuracy of the barometer is hard to discern. Tests made in cool weather show that the barometer readings vary considerably with temperature changes. For example the barometer was calibrated to the weather bureau at 66°F, but when taken outside to 43°F, the reading dropped 0.10"Hg. Then when warmed to 71°F, the reading increased 0.21"Hg from that point. Several temperature cycles (all compared to the weather bureau) indicated that the barometer readings drop with temperature decreases and increase with temperature rises. As compared to our measurements of Garmin's 76S barometer accuracy of 0.02" Hg, the Platinum barometer appears not to indicate a useful measurement. The relationship of the barometer to the GPS altitude isn't known at this time. However, the barometer readings don't increase with altitude decreases (and vice versa) as the Garmin Vista (incorrectly) does.